A healthy half year return beckons from our winning weekly wagers. Now we plan for an equally prosperous new year. Our balance stood at 125 points, and with this win has risen to the maximum snooker break of 147 points. This time we’ll stick to a similar formula that has been successful in recent weeks, although our good run must come to an end soon. Or will it? Total stake 17 points, reducing our balance to 130 points. Potential returns if correct in brackets. It is about time that Aaron Cresswell scored. What are the chances? The last day of the year and halfway through the season. Can it be four wins on the bounce, a scramble into the top half of the table and can Michail Antonio claim the ‘golden bonce’? If history has taught us anything it is to select the bits of it that we like the look of and disregard the rest. Today West Ham travel to Leicester to face a side who we have traditionally done well against, with some particular success in games played during the Christmas and New Year period. Victory would make it 4 Premier League wins on the bounce for the Hammers; a feat that, while not unprecedented, is as rare as a proper right back or a 20 goals a season striker. In fact our Premier League record is 5 consecutive wins established during January to February 2006; an achievement that could potentially be matched in the next 3 days – or not! Our hosts and last year’s Champions have struggled to come even close to last season’s ebullience despite making an admirable and successful fist at Champion’s League qualification. A danger when your team is based on being greater than the sum of the parts is that it can all fall apart when some of those parts stop working. The loss of N’Golo Kante has been Chelsea’s spectacular gain, Riyad Mahrez has failed to inspire, the defensive shenanigans of Huth and Morgan have been under increased refereeing scrutiny and the threat of the ball over the top to Vardy tactic has been neutralised by most opponents. Thankfully the snarling one is suspended for today’s game and will not be able to test the speed or extent of our own learning curve. I did think that once the Champion’s League group stages were over we would see a resurgence from Leicester but as yet, apart from a fine win against Manchester City, it has failed to materialise. Is it possible that the most unexpected Champions since Ipswich Town in 1962 could suffer the same fate and face relegation shortly after? West Ham’s overall record against Leicester is a moderately good one and the Hammers have avoided defeat on their travels to the east Midlands more often than not. The last 12 meetings have seen honours equitably shared with 4 wins for each team and 4 draws; a sequence that includes our solitary win at the King Power stadium following the Foxes move from Filbert Street in 2002. Our player of the season so far, Pedro Obiang, is available again after suspension so let’s hope that Slaven Bilic is not so blinkered as to leave him on the bench and stick with the team that won at Swansea. Personally, I would play Obiang and Kouyate as a defensive midfield two and give Mark Noble some bench time. This would retain the back 4 by keeping Nordtveit at right back despite his offering little attacking capability. Slaven is unlikely to heed my advice, however, and will probably return to his (unaccountably) preferred back 3. Manuel Lanzini may be available again but I don’t expect him to make the starting XI with Andre Ayew given the nod again following his maiden goal last weekend. Reece Oxford can be added to the long list of players who have found their way into the treatment room only to find that there is no way out. If Michail Antonio scores with his head today he will create a Premier League record for headed goals in a calendar year – the golden bonce! Apart from suspended Jamie Vardy, Leicester are at all full strength with Huth and Fuchs returning from one match bans. A third West Ham away game this season for Anthony Taylor from Manchester; the previous two affairs ending in defeats at Chelsea (where he failed to send off match-winner Diego Costa) and at Everton. Taylor has had a busy season officiating at 20 games in which he has waved 69 Yellow and 3 Red cards. Can we make it four wins in a row as we reach the half-way point in the season? This is our nineteenth Premier League match, and at the end of the game we will have reached the mid-point of the league season. A season that we started poorly, but one where our results have picked up in recent weeks. Leicester were, of course, the very unlikely (5000-1) winners of the Premier League last season, but this has been a much tougher campaign for them. Who would have thought that, despite some of our relatively indifferent performances, we would be sitting above last season’s champions at the half-way point in the season? The last time we played at Leicester was when we visited them in April. Despite being one down at half time to a goal from Vardy we fought back in the second half (after our old friend Mr Moss had reduced Leicester to ten men by sending Vardy off for diving). Carroll scored from a penalty (Noble had already been substituted when it was awarded), and then Cresswell hit a superb strike to put us 2-1 ahead. It was quite simple now, wasn’t it? 2-1 up, 11 playing against 10, we were about to record yet another famous victory away from home against a top side. Arsenal, Liverpool, Manchester City, Manchester United, Chelsea and Everton – none of them could beat us on their own ground, and we had recorded four wins and two draws against those six teams. Now we were about to beat the champions elect. But hold on a minute. This is West Ham we are talking about. We have to expect the unexpected. Mr. Moss had indicated that there would be a minimum of four minutes to be added. With around 20 seconds of the four minutes remaining the ball broke to Valencia. It should have been easy to run down the clock, shouldn’t it? But oh no, Valencia lost possession, and with 3 minutes 56 seconds showing on the injury time clock, Carroll innocuously brushed against a Leicester player on the edge of the area. Of course, referees never give decisions to even up potential mistakes that have made earlier in a game, or to try to appease the home supporters, so Mr. Moss must have been absolutely certain that a foul had been committed and duly awarded Leicester a penalty in the dying seconds. Of course, the same referee had “previous” in this respect, giving Tottenham a penalty in the fifth minute of injury time the previous season, allowing them to draw 2-2 against us. I guess the biggest disappointment for me was our inability to hold on to a lead, something we have been guilty of several times this season, too. Despite their indifferent league form, Leicester comfortably (and surprisingly?) have reached the last 16 of the Champions League, which is no mean feat. But in their attempt to retain their title, they currently sit in sixteenth place in the league on 17 points, just three points above the drop zone, and trailing us by five points. They have won just four league games, beating three teams that we have also beaten, Swansea, Burnley and Palace, in addition to what was arguably their best performance of the season, a 4-2 victory over Manchester City, where at one stage they led by four goals, before conceding twice in the last ten minutes. We have a very good record in games against Leicester, and in our last 41 league meetings they have only beaten us on nine occasions, with six games ending as draws. I fancy us to extend our good run with another victory, to set us up nicely for an improved second half of the season. 25 points from 19 games seemed an unthinkable proposition just a month ago. A victory in this game will bring us up to that level. What are the chances? Seeing the old year out in the company of the BBC’s preeminent pundit predictor. Eighteen rounds of games in the Premier League have now been completed. That means we have now predicted the results of 180 matches. In Week 18, Rich scored 8 points, Geoff 12 points, and Lawro 12 points. Perhaps Rich is getting complacent in the lead as the others are closing the gap. Proving that if, like every politician or CEO, you carefully select your statistic and starting point Geoff forecast that on the strength of the last 3 weeks he was firmly on track for a comfortable lead by the time the daffodils were out. In this challenge we award one point for a correct result, and a further two points (making three in total) if the score prediction is spot on. We now march on to week 19. After this week we will have reached the halfway point of the season. Part 2 of the look back at the week 26 December to 1 January in Hammer’s History. This Week in Hammer’s History has already taken a look at some of the memorable Boxing Day games over the years and now, as promised, we will cast an eye over other matches that have taken place between 26 December and 1 January. In the days where games really did come thick and fast, rather than being a figment of manager and commentator imagination, high scoring matches were quite common; possibly due to players being more liberal in their festive celebrations at a time away when the possibility of twitter and facebook exposure was not a threat. Fixtures on New Year’s Day are common nowadays but prior to 1974 it was just an ordinary working day and not a public holiday in England. Still time, however, for the first day of the year to feature a number of high scoring encounters of which, the low point, was a 6-0 away drubbing for Alan Curbishley’s struggling side (Tevez an unused substitute) by the mighty Reading. In 1974, the new holiday brought the Hammers a 4-2 home win (Paddon 2, Gould, Brooking) at home to Norwich while we returned the favour in 1988 going down 1-4 (Cottee) at Carrow Road. Other New Year’s Day successes came with: a 4-0 away win at Orient in 1980 (Pearson 2, Devonshire, Pike); a 4-1 home victory over Leicester in 1987 (Cottee 2, McAvennie, Dickens) and a 4-2 win at Upton Park against Barnsley in 1990 (Keen 2, Dicks, M Allen). West Ham also racked up four goals during the course of the week with 4-0 home wins against Blackpool in 1966 (Peters, Moore, Byrne, Hurst) and Blackburn in 1978 (Taylor, Cross, Robson, Own Goal). Noteworthy successes on the road included a 4-3 win at Nottingham Forest in 1962 (Brabrook 2, Byrne. Own Goal) and another victory in 1967 against Leicester by the same 4-2 score-line as in the home fixture on Boxing Day, four days earlier (Dear 2, Brooking, Sissons). On the last day of 1983 West Ham entertained pantomime villains Tottenham Hotspur at Upton Park. The Hammers were riding high in the top division that season having won their opening 5 games and had already beaten Spurs 2-0 at White Hart Lane in September. Hopes were high that season (at least mine were). We had been in the top 3 or 4 for almost all of the season and the team had a firm foundation built around Parkes, Stewart, Martin, Bonds, Brooking and Devonshire plus a young Tony Cottee knocking them in regularly. 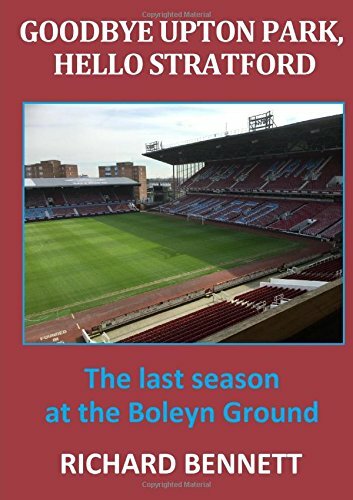 This was to be Trevor Brooking’s last season before retirement and there was a feeling that it could end with something special. On the day Spurs were blown away, 4-1, with goals from Stewart, Martin, Cottee and Brooking. At the end of the year and with exactly half of the games played we stood in 3rd spot, two points behind Manchester United and five behind leaders Liverpool. Sadly this was to be one of the years where we faltered in the second half and despite keeping in touches with leaders until the middle of March West Ham then faded badly to end the season in 9th place – one point and one place below Tottenham. A Boxing Day stroll in South Wales. The last time we played Swansea was when they visited us in the final Saturday home game last season at Upton Park in May when they inflicted on us our heaviest home defeat of the season, beating us 4-1. It was fitting to return the compliment and beat them by the identical score on Boxing Day. When Andy Carroll blasted the fourth goal into the Swansea net in injury time it got me thinking. When was the last time we scored four goals away from home in a Premier League match? The last time I can actually remember was once again on Boxing Day in 2008 when we visited the south coast and put four goals without reply past Portsmouth. And where are they now? Craig Bellamy scored twice with a goal apiece from Carlton Cole and Jack Collison. We may have scored four goals on our travels since then; it certainly happened three or four times in the Championship, and also at least once in the FA Cup, but not in the top flight unless there is a game that has slipped my mind. And it would be very unusual to forget scoring four goals away from home as it doesn’t happen very often. Of course along with all our fans I was delighted that we picked up the three points. It is always good to win games without being totally convincing. That’s ten points now from four games, a haul that I don’t think we bettered in four consecutive league games in the last memorable season at Upton Park. We now have the opportunity to go one better and make it four wins on the bounce with the forthcoming trip to Leicester. The manager thought that it was our best performance of the season and he may be right. But we shouldn’t be kidding ourselves into thinking that everything is now OK. We are not yet playing at the level we achieved last season and, of course, many theories have been put forward as to why that is. I believe that injuries and confidence are two important factors, as is fear when you are involved in a relegation tussle. As we distance ourselves further from the bottom three, I hope that the fear factor will diminish, and hopefully disappear altogether. We are not yet out of the woods, but I can see us pushing on now into the top half of the table. These days many people appear to believe that most things in life are either black or white. This is exacerbated within the media and social media. When we are not winning then the team is (fill in the missing word or words), and a range of expletives are directed towards the players, the team, the manager, and the board. When we turn it around and start to win games the expletives disappear, and all of a sudden the world is a wonderful place and we’ll soon be challenging for a top four spot. The reality of life is that most things are not black or white, but one of 50 shades of grey in between. We weren’t the worst team in the Premier League earlier in the season, and now we are not the best. We fall somewhere in the middle of the pack, and we need to improve if we really want to be challenging at the top. Of course, to coin a popular phrase, there are lots of positives to come from our recent revival in terms of results, but still a way to go to be totally convincing in performance. But we are all a lot happier than we were early in December when we sat in the bottom three. So well done to all involved for where we are now, but it’s not “job done” yet by a long way. One way we have improved over last season is in our ability to beat teams in the bottom half of the league. Of course we finished in the top half last season, but one of the (justified) criticisms levelled was our inability to pick up as many points as perhaps we should have done against the lesser teams. In 2015-16 we managed an average of 3.33 points in our two games against each of the teams who finished in the top ten, but could only get an average of 3.2 points against the bottom ten teams. This season at the moment we sit in a relatively comfortable eleventh place, and our six victories have all come against teams who are below us. Only two of our twenty-two points have come against teams above us, the away draws at Old Trafford and Anfield. Because of the way that the fixture list has worked out, seven of the ten teams above us will be visiting the London Stadium in the second half of the season. Hopefully we can balance out our results and pick up more points against the top teams, just as we did last season. The loss of players to the African Nations Cup will hit us harder than many others, and it remains to be seen if any significant transfer activity will be able to strengthen the team. Nonetheless, the results are looking good at the moment. Long may it continue. Sifting through the left-overs to dissect the latest resurgent West Ham success at Swansea. Three wins on the bounce and we are now safely ensconced in a mid-table cluster of teams beginning with ‘W’. As they say “You can only beat what is in front you” and the Hammers completed a comfortable, rather than convincing, victory against a team who looked resigned to relegation. Having fortunately seen off the other cast-iron relegation candidate, Hull, last week the win over Swansea was a little more straightforward. It may have been (as Slaven said) our best performance of the season but then there is not too much competition for that particular accolade. We still lacked overall cohesion and fluency, passing was below standard expected at this level and we gave the ball away too cheaply. Swansea were able to boss the midfield but it was our good fortune that they were fragile in both defence and attack. What a bizarre decision it was to appoint someone with as little European football experience as Bob Bradley to the job of manager. Go Swans! I have been a harsh critic of Havard Nordtveit’s performances to date in the claret and blue but on this occasion he did an adequate job. Deployed as a right back he maintained discipline and did what he had to do defensively. Although a defenders prime responsibility is to defend at this level there has to be a little more to your game; so far Nordtveit does not give the impression he can offer very much going forward as a right back. A competent stand-in but not the answer to our long running right back dilemma even if, I guess, there was an assist to his name for Antonio’s goal. As for the rest of the defence: Winston Reid again had an excellent game; Ogbonna mixed competence with clumsiness; and Cresswell had another disappointing outing and was at fault for the Swansea goal. A pat on the back too for Darren Randolph who, despite Swansea’s lack of penetration, had to pull of a handful of smart saves. I have to admit to being a big fan of the young Swiss midfielder. He may only have been on the pitch for just over 15 minutes but in that time brought a fresh dimension to the midfield. He shows good movement and uses the ball intelligently and accurately. There is nothing showy about him but he moves the ball quickly, decisively and (critically) in the right direction. Fernandes played an integral part in both the last two goals even if he was not credited with the assist for either. Collectively the midfield are still guilty of being largely static, not creating enough passing options and playing too many backwards and sideways passes. The general lack of width was perturbing with the usual threats of Antonio and Cresswell showing little inclination to stretch the opposition defence. In fact, I thought both had relatively poor games. Difficult to know whether Antonio was under orders to adopt a more central position or not? Still with 8 Premier League goals from 17 appearances to his name who is to complain – can he make the elusive 20 goals in a season target? It is part of football folklore that a player struggling with form will finally make his mark when he returns to play against his old club. So it was with Andre Ayew who only had to wait 13 minutes before he was able to roll home the fumble from Fabianski after good work from Noble, Carroll and Kouyate. That the returning player scenario is not a myth is supported by the apparent, unusual stat/ fact that, in the history of the Premier League, 41 players have now scored both for and against West Ham. This is apparently more than any other club but I am not sure what conclusion, if any, we can draw from it. There was another decent performance from Andy Carroll even if there were few occasions where he was given service in those dangerous, unplayable situations that we hear about; he is still in one piece and doubled his season’s goals tally while at it. Encouraging to see that Sofiane Feghouli’s first successful cross of the season provided the assist to Big Andy’s strike.